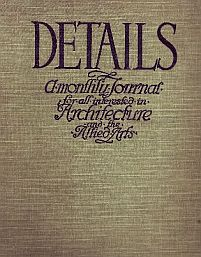 Edited by the architect, R. Randal Phillips (1878-1967), this short-lived monthly journal contains detailed descriptions, photographs and plans of architectural features in contemporary British buildings. Includes arcades, balconies, bridges, carvings and sculpture in stone and wood, chimney-pieces and fireplaces, church work, doors, doorways and entrances, door furniture, floors, gates, gate piers and railings, leadwork, panelling, plasterwork, ponds and fountains, shop fronts, staircases, wall treatments, and windows and window treatments. Among architects whose work is included are J.D. Sedding, Edwin Lutyens, Aston Webb, E. Guy Dawber, Ernest Newton, Maxwell Ayrton and W.H. Bidlake. Details was absorbed into the Architectural Review in January 1910.